My first step in making this piece for the Re-Riding History project was to stain some white washi (Shikoku white) with tea to give it an aged appearance. I used English tea, of course. 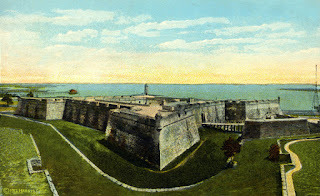 English breakfast tea, which might have been served when visitors from northern cities like New York, Boston or Philadelphia came to St. Augustine, Florida, to see Lt. Richard Pratt's new Indian 'students' at Fort Marion. 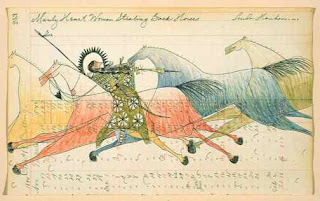 The curators of Re-Riding History have asked the artists to create our work at 9.5 x 11 inches, a size which references the dimensions of most Plains Indian ledger drawings. In the mid-1800s, Plains warrior artists acquired ledger books, pencils and watercolors through contact and conflict with European Americans, and they used these tools to record both their history and the tumult they were enduring. 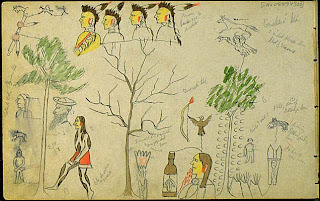 The internment of the seventy-two captured Kiowa, Cheyenne, Arapaho, Caddo, and Comanche chiefs and warriors at Fort Marion in Florida inadvertently supported ledger drawing as a popular genre of Native arts, as the drawings by the prisoners were often sold to tourists. Prisoners were encouraged to draw their memories and recent experiences, and in many cases they documented their own process of assimilation. 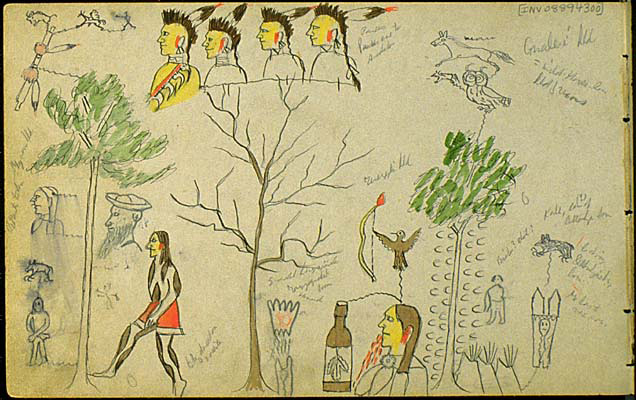 Click here to see some ledger drawings by native Americans at Fort Marion on the Smithsonian web site. This month I’m taking a short break from my current series to work on a piece for a project called “Re-Riding History: From the Southern Plains to the Matanzas Bay” organized by Emily Arthur, Marwin Begaye, and John Hitchcock. 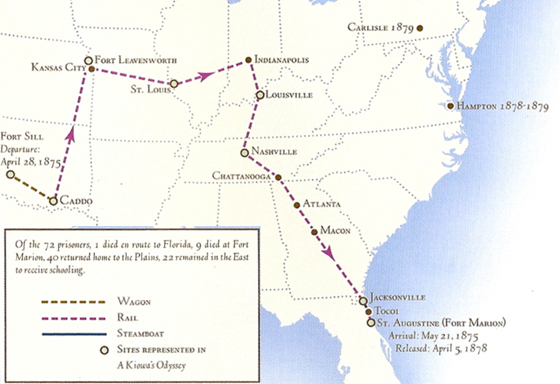 The three curators have invited 72 artists to create works inspired by the story of the relocation and imprisonment of 72 Plains Indians who were captured in 1875 at Salt Fork, Oklahoma, and brought by wagon, train and boat to Fort Marion in St. Augustine, Florida. 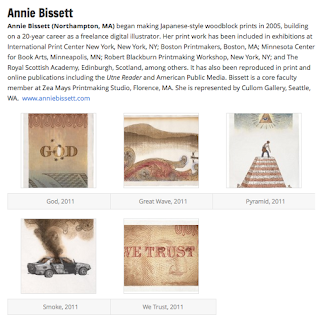 As followers of my blog probably know, I’ve been interested in Native American history for almost as long as I’ve been making woodblock prints, and I’ve done a number of works on the topic (see some here, here and here), so I was touched and excited when Emily Arthur invited me. I said yes immediately, was offered a PDF full of research links on the topic, and I’ve spent several weeks now learning about this little-examined incident in America’s inglorious relationship with our native peoples. Shortly after their arrival, with no explanation or warning, Pratt removed the prisoners' shackles, cut their hair and issued them military uniforms, which they were expected to care for as any U.S. soldiers would. After a time, they were organized into companies and given instruction in military drill. 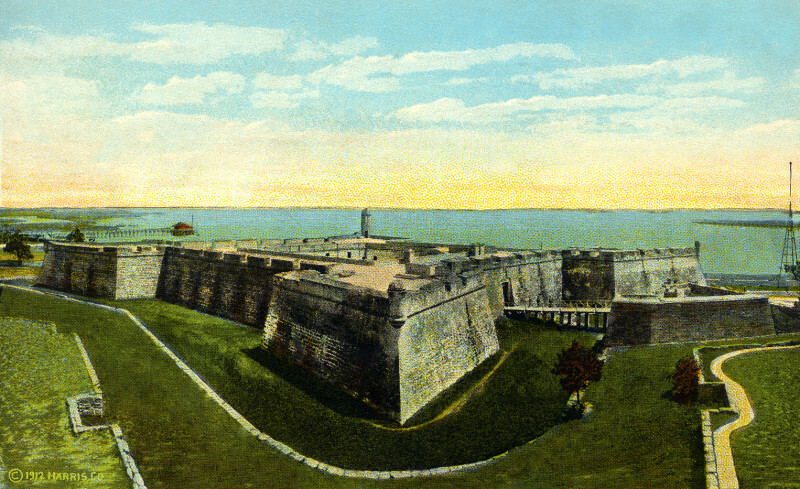 Eventually, their military guards were dismissed and several of the most trusted Indian prisoners were chosen to serve as guards. It was a quietly insidious and effective program, and Pratt became an ardent evangelist for these methods. 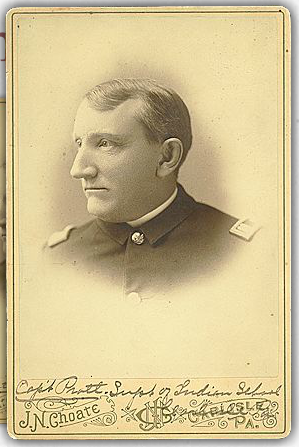 In 1879 he founded The Carlisle Indian School in Carlisle, Pennsylvania, where he would remove Indian children from reservations and tribal influences and transform them into ‘American citizens.’ Although Pratt’s methods look cruel and abusive to our eyes, they were a great improvement over the extermination policies that were in place at the time. The curators of this project have suggested several directions for artists to take: biographical (to work with the story of a particular prisoner), topographical (work with any of the locations related to this history), or art historical (respond to the art made by the prisoners). I’ll be doing a little bit of each of these things, but as a northerner and an Anglo-American, it is the story of Richard Henry Pratt and his Indian School in Pennsylvania that most captured my attention. In the next couple of weeks I’ll be posting about this project as I work on it. Addendum: There is now a website for this project here. The movie The Wizard of Oz has stereotypically been associated with gay culture. This may be because the film can serve as an apt allegory for the coming out experience: knowing that you're different in some way and, upon acceptance of that difference, entering a new world. The tale of an isolated adolescent from a dreary place in the middle of nowhere being transported to a land where everything is brightly colored and friendly and fabulous is a perfect metaphor for the story of many rural homosexuals who have migrated to large urban centers. And in another metaphor easily understood by gays, the scarecrow, tin man, and lion (played in high camp style by actor Bert Lahr) are misfits who join with Dorothy to form a family, with all four of these characters loving each other into the discovery that what they were looking for was already inside them. This Wikipedia entry on Judy Garland as a gay icon makes more connections if you're interested. First, transfer your sketch to some blocks of wood using carbon paper. On this print, you can see an emboss (indentation in the paper) where the tops of the socks will be. I wanted to see if I could get a deep enough emboss so that a white line would appear when I printed the socks in blue. As you can see, the white line didn't work very well. I think the paper I'm using is too thin for that technique. This photo actually shows two printing steps. First I printed the red shoes, then I did the stars. The final step was to “typeset” some dialog from the movie using a rubber stamp alphabet. 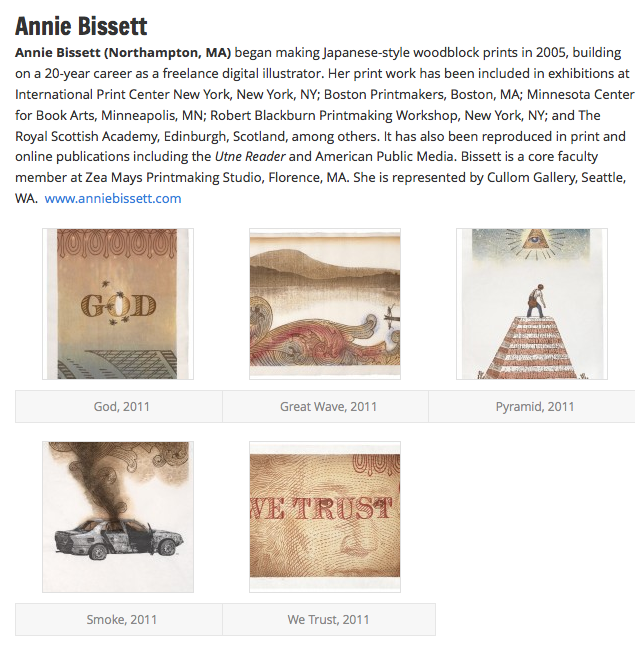 The accepted works in The Print Center's 87th Annual Competition are now online for your viewing pleasure. Five large prints from my Loaded series are included, along with work from 42 other artists and photographers. Warning: you can easily spend an hour or so looking at all the entries. Some of my favorites include Lindsey Beal's photo-based depictions of common STDs, Bobby Davidson's digital c-prints of ghostly images of common objects, Stella Ebner's saturated and detailed screenprints depicting American cultural moments, and Jenny Robinson's oversized architectural monoprints. Many thanks to juror Irene Hofmann, Phillips Director & Chief Curator, SITE Santa Fe for including my work in the show.